Here in Central Kentucky, where we’ve just gone a month without rain, the grass and leaves are both turning brown, the evenings require a light jacket for the late dog walk, and the sun is blinding through the windshield on the morning drive east toward the office. 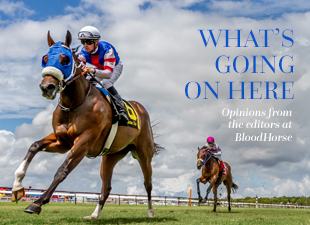 Summer is finished, which means Horse of the Year talk is just heating up. With two rounds of significant races left in the season—one in early October and the last a month later at the Breeders’ Cup—the battlefield for HOY is pretty well crystallized. And 2010 presents a far different picture than 2009, when HOY became a head-to-head battle between two horses that never went head-to-head on the racetrack. There forever seems to be two schools of thought on picking HOY. One bloc holds forth that the best horse deserves the honor; the other that the horse that accomplished more on the season is the one to select. The past two times this dichotomy came to a head, the “accomplishment” horse came home with the hardware. In 1997, Favorite Trick enjoyed a spectacular season beating up his fellow 2-year-olds in undefeated fashion. Skip Away, meanwhile, proved the best older horse and won the Breeders’ Cup Classic (gr. I) for fun. Favorite Trick was voted HOY, although anyone who thinks he could have gotten within five lengths of Skip Away on the racetrack is clearly delusional. Last year Rachel Alexandra ran the table in eight starts, beating males three times and older horses once. Zenyatta was a perfect five-for-five and won the big one, the Breeders’ Cup Classic, becoming the first female to do so. As great a year as she had, it would be very difficult to envision Rachel Alexandra beating Zenyatta in that race. In fact, despite skipping the race that was designed to define champions, Rachel was awarded HOY based on her previous accomplishments. That vote had ramifications beyond Jess Jackson carting a trophy up to his vineyard. On that late January evening after the vote was announced, Zenyatta owner Jerry Moss looked shell-shocked, like some technology had pulled the plug on his beloved music industry. Wait, that did happen. But Moss clearly wasn’t expecting Zenyatta to lose the HOY vote. Hadn’t she won the race that was supposed to anoint champions? Hadn’t she been perfect? Hadn’t he a right to be ticked off? I won’t go into the qualifications or wisdom of the voters for year-end awards, except to admit that on a regular basis I fail to understand their logic, if any. But I will say they unintentionally did racing a favor with this particular vote, since it undoubtedly played a role in Mr. Moss deciding to bring Zenyatta back in 2010 for a 6-year-old campaign that no one would have predicted before that Eclipse Award night. Now, Team Zenyatta has heard it from several corners, including this one, that her 2010 campaign has fallen short of the original bravado to take her to new places and different races and let fans in other regions thrill to seeing her in person. The bottom line, however, is this: If Zenyatta scores a repeat victory in the Breeders’ Cup Classic, absolutely no one is going to care about her season up to that point. She will be voted HOY. If she loses the race, then the low-risk strategy will prove fatal to her chances. This year, unlike the previous couple, we have every expectation that HOY will be determined by the Classic. Any of the Big Four—Zenyatta, Blame, Quality Road, or Lookin’ At Lucky—that wins the Classic is HOY. This year, you have to be in it to win it. The only voter discretion will come if a Volponi or Arcangues jumps up to stun the race. Even then, a close-up finish by one of the Big Four would prove critical as a deciding factor. If they all finish up the track, the field opens up to include Blind Luck or Devil May Care if either wins the Ladies Classic (gr. I). Whatever unfolds in the waning months of 2010, and whether or not Zenyatta gets her HOY, her 18-for-18 record has already transcended a single year-end award. History tells us a horse like this come doesn’t come around but once every 30 or 40 years. Let’s appreciate what we’re lucky enough to witness.